When I heard of Lincoln Brower’s passing, I remembered how I dreamed that my father had turned into a monarch butterfly after he had died. But with Lincoln, the story could not be as simple as just one transformation. He was a truly ecological lab scientist of incredible ingenuity in experimental design, a skill that he applied to the study of mimicry and milkweed toxicity as they relate to monarchs, viceroys and queens. His ingenuity and originality was evident in the paper on this topic published in Nature, but he then found a way to explain such as complex story to millions of environmental educators as well. And so Lincoln was a remarkable teacher, both in the classroom and in the field, as I witnessed on many occasions. And yet, he was also a field scientist with superb skills and insights, one whose studies will stand the test of time. At some point along his career trajectory, he also became what we now call a conservation biologist… He could not merely study species that were in decline; he had to call out the root causes of those declines. He was dismissed by industry as a brazen activist, but he was not. He was a scholar-activist exercising his civic responsibility, as we all should do. That also transformed Lincoln into a cross-cultural bridge-builder, a global citizen and performance artist in the best sense of the word. When monarch butterfly numbers in Mexico went into precipitous decline, Lincoln and other prominent scientists collaborated with Homero and Betty Aridjis on an open letter to the leaders of Mexico, the U.S. and Canada that got picked up by the New York Times and many other publications. It went viral on social media. Our Make Way for Monarchs website received over 2.5 million visits over its first two months of existence due to the momentum that Lincoln, Betty and Homero created with their broader team. I saw Lincoln at a biodiversity conservation symposium a few months later where he showed slides of intentionally applying glyphosate weed killers to a milkweed patch to dissuade those who were in denial that herbicides had any effect on milkweeds and monarchs. Imagine that: a monarch scientists graphically showing, step by step, the damage done by the inappropriate use of herbicides. We also joined together with several other scientists and writers to give lectures on the perils of herbicides at nearly every university, zoo and botanical garden in close proximity to the headquarters of one of the biggest producers of herbicides. We felt their community needed to be engaged in the ethical debate over such issues. In these arenas, Lincoln was a master showman. But still a scientist. When I was editing a book on migratory pollinator conservation for the Arizona-Sonora Desert Museum in the 1990s, Lincoln collaborated with Robert Michael Pyle on an alternative view of western monarch migration that posed hypotheses that are still being productively explored twenty years later. 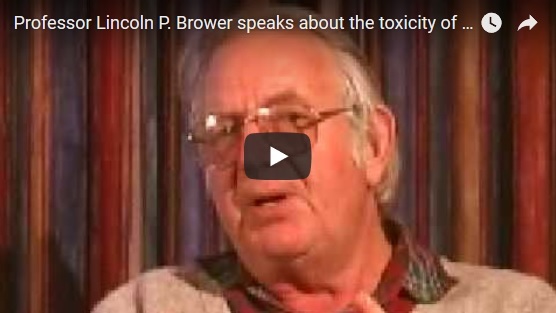 When I was told that Lincoln Brower had died, I am sure that I already knew he was a mortal. But at the same time, I sensed that no one understood metamorphosis and metanoia better than Lincoln did.